As we near the end of Mike White March, we come upon the curious case of Mad Dog Morgan, a film that benefits having prior knowledge about the insane behind the scenes machinations due to the powerhouse of acting that was Dennis Hopper. 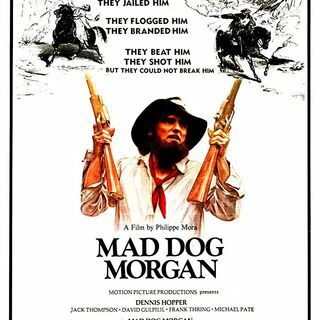 Starring the Hopper mentioned above, the film follows the exploits of the infamous bushranger and all around ne'er-do-well Dan "Mad Dog" Morgan as he caused trouble for the Australian government in the mid-1800s. Dennis Hopper's offscreen ... See More antics translate to a true method performance as the unhinged Morgan along with some cinema verite style that is reminiscent of Alejandro Jodorowsky. The Projection Booth's Mike White joins Chris once again to talk Hopper's performance, the translation from page to screen, and more familiar faces from Aussie cinema. You can follow Chris Stachiw at @KultureStach and the Kulturecast @kulturecast. The music is an original track from Eric Kniss of Wovoka. You can also subscribe to the Kulturecast on iTunes here. Also, don’t forget to check out our official Facebook page for news, upcoming reviews, contests, and new content along with our Patreon page.